Our website address is: http://newhorizonathlone.org. 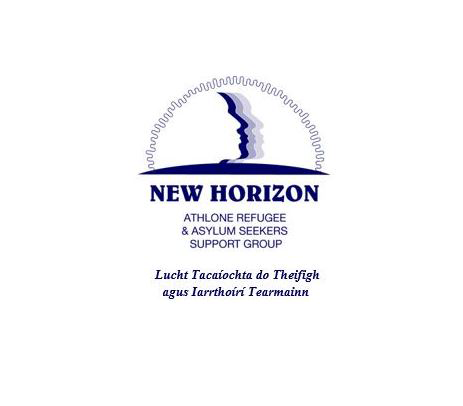 New Horizon – Athlone Refugee and Asylum Seeker Support, are committed to maintaining the trust and confidence of all visitors to our web site www.newhorizonathlone.org. In particular, we want you to know that New Horizon is not in the business of selling, renting or trading email lists with companies and businesses for marketing purposes. We are not a government-supported organisation and maintain strict confidentiality in all our dealings with refugees, asylum seekers, volunteers and other support groups. We do need some information to be able to do our support work. When someone visits www.newhorizonathlone.org we use a third party service, Google Analytics, to collect standard internet log information and details of visitor behaviour patterns. New Horizon provides WI-FI to enable people to access online courses and information sources. You can unsubscribe to general mailings at any time of the day or night by clicking the unsubscribe link at the bottom of any of our emails or by emailing our data protection officer Gerry Callaghan. We may share limited personal information, such as name, gender, phone number, email addresses and study choices with our education partners. We may share anonymised personal information with other organisations such as the Irish Refugee Council and our funders. They will use this anonymised data to develop refugee protection policies and evaluate projects. We will not share sensitive information without the explicit permission of the information owner. Email your request to our data protection officer Gerry Callaghan.